The increasing penetration of smartphones and internet have helped Google Android to get an edge over the Microsoft Windows OS which has been dominating the PC market for long. According to a new report published by Statcounter, as of February of 2017, Google Android has captured 37.4% of the total market share of OS in terms of internet usage, worldwide. This puts Android barely behind leader Microsoft Windows OS, whose share for Internet usage stands at 38.6%. As it stands, Android is sure to overtake Windows OS in market leader in the very near future. Let’s analyse how the rapid rise of the mobile internet has quickly led to the decline of desktop internet usage and its market share, and what this bodes for the future. These days the internet is an integral and unavoidable element of human lives, dominating our work, home and entertainment realms. This, however, was not always the case. IDC puts the total number of internet users worldwide at 16 million in December of 1995, which was a mere 0.4% of the population at the time. This figure has since risen exponentially, with people adopting the Internet at an unprecedented rate. Internet World Stats estimates 3,675 million users of the Internet worldwide as of December 2016, which accounts for 50.1% of the world’s population. For a long time now, the primary method of gaining access to the internet had been the Personal Computer and its dominant Windows operating system. According to Statcounter data, Windows accounted for 82% of global Internet usage as recently as February 2012. This is definitely no longer the case, and Windows’ once unassailable lead is set to be completely nullified very soon. As Aodhan Cullen, CEO of Statcounter puts it so aptly, the unthinkable has happened. In January 2012, Android commanded a mere 2.2% share of OS in terms of global internet usage, which has since risen to 37.4% in February 2016. The chief driving force behind the decline of Windows’ Internet usage market share has been the explosive adoption of smartphone and tablets in recent years, with Android leading the pack. 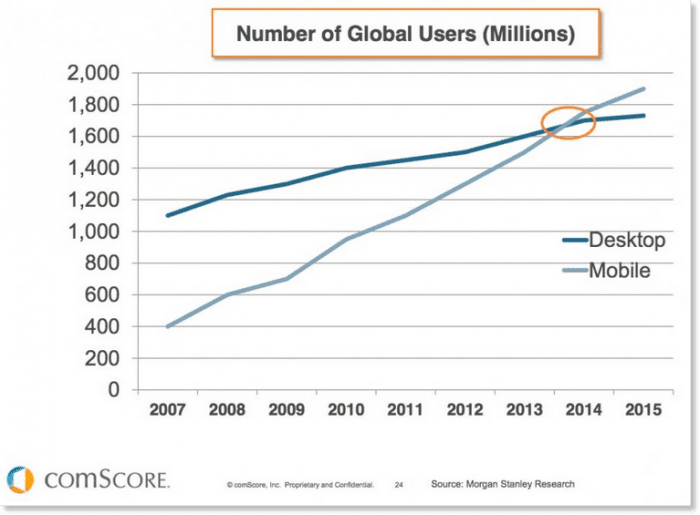 Data by Comscore showcases the huge increase in global mobile users from around 400 million in 2007 to 1900 million in 2015. This amounts to an incredible 375% increase in under eight years and resulted in mobile users overtaking desktop users in 2014. 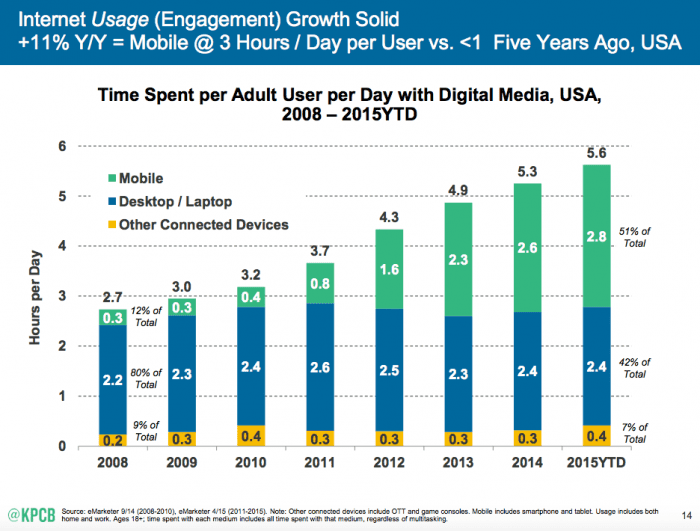 As the user base of mobile devices has changed, so have user habits. Research firm eMarketer released data which shows a steady increase in media consumption on mobile devices ever since 2008, while media consumption patterns on desktops have more or less remained stagnant, with marginal gains and losses in between. Emerging markets, like in developing countries where the mobile user base is much larger than the desktop user base, have increasingly encouraged a “mobile first” approach of late. Now, more and more Internet content and media are being created and are optimised for mobile devices. Another major contributing factor to the rising consumer adoption of Android mobile devices for internet usage was the introduction and improving proliferation of increasingly faster wireless networks. The worldwide launches of 3G networks in the mid 2000’s changed the way mobile internet was used in countless ways. While previously it was primarily used for email clients and basic web browsing, high-speed 3G networks enabled media sharing and consumption on the mobile device itself. The subsequent launch and adoption of the first 4G network in late 2009 only solidified mobile’s position as a major media consumption device. Coupled with the steady rise of mobile adoption has been the decline in desktop internet usage and declining sales of the platform itself. Data by Comscore suggests declining PC internet usage year over year. Usage fell by 9.3% in December 2015, 7.6% in January 2016 and 2% in February 2016 as part of a larger pattern of steady decline. Desktop sales themselves have been on the decline too, with Gartner estimating a 3.7% decline in shipments during Q4 2016 as compared to Q4 2015. Despite its falling market share for overall internet usage, Windows OS remains the unequivocal leader in the global desktop operating system market, accounting for 84.1% internet usage share in February 2017. Windows has also maintained its dominance in desktop operating system market with 83.9% share in February 2017, which is slightly down from 89.5% in February 2012. The second most popular desktop OS is Apple’s MacOS with a mere 11.56% of the market share as of February 2017. While Windows has undoubtedly conquered the desktop, the platform itself is now in decline. The battlefield has shifted, and the future of internet access lies with mobile devices and the Android operating system.